In the long story of the evolving Iran nuclear issue, we naturally tend to focus on whatever is the chapter immediately before us. Right now that mainly involves the negotiation-subverting Kirk-Menendez sanctions bill, which President Obama in his State of the Union address explicitly threatened to veto if Congress passed it. But we also ought to keep a longer-term view of how opponents of an agreement with Iran have kept changing their tune and changing their arguments as their earlier arguments have become inoperative. Back when the Iranian president everyone loved to loathe, Mahmoud Ahmadinejad, was still in office, the go-to tactic for opponents was to cite whatever was the most recent outrageous rhetoric that had come out of Ahmadinejad's mouth, whether or not it had anything to do with the substance of the nuclear issue. That tactic did not work so well after Hassan Rouhani replaced Ahmadinejad, although there still seems to be little hesitation in repeatedly going to the well of mistranslated vintage Ahmadinejad "wipe Israel off the map" comments. The emphasis has now become less on what Iranian leaders say than on what nefarious intentions supposedly lurk behind what they say -- hence Benjamin Netanyahu's "wolf in sheep's clothing" formulation. There also once was much doubt expressed about whether the Iranian leadership would ever want to negotiate seriously. Then when serious negotiations got underway last fall, there was doubt expressed about whether Iran would make significant concessions about its nuclear program. Then when Iran made major concessions in the Joint Plan of Action (JPA) concluded in November, opposition tactics had to be adjusted again. The tactics in the wake of the JPA have taken several forms. One is outright misrepresentation about this preliminary agreement, including talk about its unbalanced and disproportionate nature -- which is true, except that it was Iran that made disproportionately large concessions. Another is sabotage disguised as support for negotiations, which is what the Kirk-Menendez bill is all about. Another tactic is the moving of goalposts, and in particular the deal-killing demand to end totally any Iranian enrichment of uranium. Yet another is in effect to change the subject and to pretend that the question is not the pros and cons of a prospective nuclear agreement but instead a popularity contest about the Iranian regime -- and anything else it may be doing that we don't like. Netanyahu provided in a speech this week a particularly vivid example of complete abandonment of a previous argument that has been negated by accomplishment at the negotiating table. 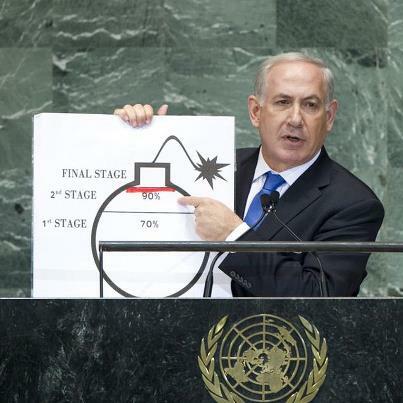 His centerpiece imagery used to be the famous cartoon bomb he displayed before the United Nations General Assembly. That cartoon would be an excellent prop for describing what has been achieved with the Joint Plan of Action, with its end to 20 percent enrichment of uranium and elimination of existing stocks enriched to that level. Except that the lines on the cartoon are moving down, not up. As Joseph Cirincione has put it, the Joint Plan of Action "drained" Netanyahu's bomb. So Netanyahu is now arguing that what matters is not the level to which Iran is enriching, but instead the sophistication of its centrifuges. And he has changed his imagery to railroads. Netanyahu puts it this way: "What the Iranians did, and this is what the agreement determined, is that they would return the train to the first station, but at the same time, they are upgrading the engine and strengthening it so that they will be able to break through all at once, without any stations in the middle, straight to 90 percent." Boris and Natasha have been replaced by Thomas the Tank Engine. Several lessons should be drawn from all this argumentative shape-shifting. One is that those making the arguments have repeatedly been proven wrong. Another is that much of what we hear from them does not reflect genuine views or any analysis but is simply flak shot up to try to impede or kill the process at whatever place it happens to be at the moment. Yet another lesson is that the opposition will never end, no matter the terms of an agreement, because the opponents want no agreement at all. If it's not one thing we are hearing about, such as enrichment levels, it will be something else, such as the particular models of centrifuge. And if it's not nuclear weapons, it will be other things disliked about Iran. If a final agreement based on the terms of the Joint Plan of Action gels, making it harder than ever to argue against the concept that such an agreement is the best way to preclude an Iranian nuclear weapon, expect to hear more about how, with or without a nuclear weapon, the Islamic Republic of Iran is so bad that it must be kept pressured and ostracized. Netanyahu laid some groundwork for such a future position in his speech when he said, "Now of course the Iranian threat is not just an unconventional threat." One of the unfortunate effects of the endless opposition is that it constitutes another form of sabotage. The Iranians may be understandably reluctant to make more concessions knowing there are elements on the other side determined to destroy any deal no matter what the terms, no matter how long it takes, and no matter what new arguments have to be conjured up.